Is it next to impossible to grow bright flowers or bunch of green lettuce or tiny red tomatoes in the limited space available? If you love greenery around, it is time to adopt a few simple techniques to get started with your new garden. • Container gardening- Pots, buckets, tubs or any other containers can be used to grow vegetables and flowers. Gardening in container controls the moisture and quality of soil. You can control the light and temperature by placing the containers on windowsill, terrace, balcony or porch. Just make sure the container size matches the plant size. Cherry tomatoes or chilli peppers grown in containers can add colors to your garden! 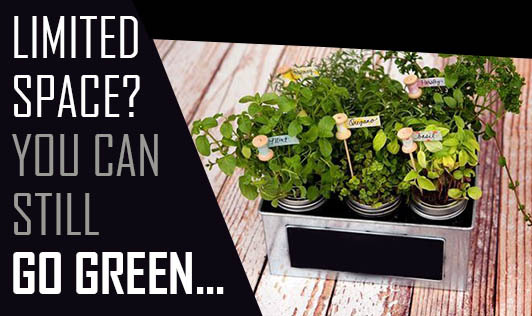 • Vertical garden- If the space to keep containers on ground or terrace is unavailable, you can still hang those container gardens with hangers or also keep it on shelves and let the plants grow vertically. Trailing plants like snow peas pot can be kept at small places available near walls and directed upwards. • Terrace garden- You can grow your own organic fruits and vegetables if you are blessed with a spacious terrace. • Hanging baskets- Transform any dull space with hanging baskets and make the space more interesting! This versatile gardening technique is used to grow not just flowers but also spices and herbs round the year. • Companion planting- A very unique type of gardening, wherein multiple plants can be grown in one container. Plants are chosen in such a way that they either benefit each other or cause no harm to each other. Best example for companion planting is growing beetroot and strawberries in the same container.